Women are mistresses of multi-tasking. But how does quantity (of activities) affect quality (of life)? Is it possible to end each day with a completed to-do list and a life unlived?^"Life! 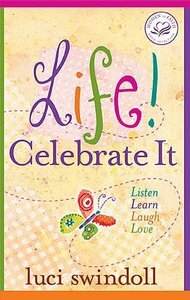 Celebrate It... the book women have been begging for offers advice for living life to its fullest. Tips on how to savor the moment, stop and have fun, love what you're doing, and more from someone who knows what she's talking about. This book will inspire women of any age to embrace a new perspective, and start living the life out of every day. ^Known for 'living the life out of every day', Luci connects with women young and old, single or married, professional women and homemakers as she challenges us all to see life through the lens of possibility. Luci Swindoll is author of Celebrating Life and a co-author of various Women of Faith devotionals. She has served as a business executive of Mobil Oil Corporation and as vice president with Insight for Living.